UPDATE: This article originally stated that all APAC tourney winners, as well as selected players, will be added to the draft pool. Only selected players will join the draft pool. Ten thousand miles away from New York, people are dreaming of New York. True to its title, the city that never sleeps is keeping players awake with hopes of spending the next six months under the bright lights of the Big Apple. The dream is real, even if New York really means Long Island City, where the NBA 2K League Studio is located. The lights are still bright, though they shine not only from the rafters but also emanate from the gaming consoles in front of the best NBA 2K players in the world. When the NBA 2K League was announced in February 2017, gamers around North America eagerly envisioned themselves suiting up for an NBA franchise. After 72,000 qualified for the inaugural NBA 2K League Combine. Competitive NBA 2K players in Australia and New Zealand were among them. But only three players from outside of North America made the 102, and none were from Australia or New Zealand. The NBA has already found striking success in international waters. For the 2018–19 NBA season, 108 international players represented a record-tying 42 countries and territories. On opening night, all 30 teams had at least one international player on their rosters. Australia, with nine players, is the second-best represented foreign country. It’s had its fair share of success, too. Patty Mills and Matthew Dellavedova have each won an NBA title. Ben Simmons is one of the best young stars in the league. And even Joe Ingles, local YMCA lookalike, has developed a near-cult following for his play with Utah. NBA 2K has taken notice. In 2018, 2K released an Australia-specific version of NBA 2K19 with Simmons on the cover. “The Aussie fans are super passionate about basketball and specifically NBA 2K, so it’s very cool to be an ambassador for both,” Simmons said in a statement. On the first episode of the league’s flagship Twitch show, The Post Up, NBA 2K League Managing Director Brendan Donohue announced that the league would conduct a LAN tournament for Asia-Pacific (APAC) players to qualify for the draft pool. “The majority of us were talking about it in the party chat every single day, asking ourselves how they would choose the players,” Milo said. The details of the tournament were opaque, with the league merely indicating that players would be selected based on combine performance and past competitive experience. Australian players immediately appreciated the concept. “When I heard about the tournament on The Post Up, I felt ecstatic, because the combine process is hard for Australia/New Zealand players,” Kyle “JimBoh” Lepua said. Multiple Australian participants reported on Twitter that combine games in the APAC region featured very few players, inducing extreme wait times. Further complicating matters was the average level of competition. Whereas combine games in North America featured mostly unheard of players, APAC combine games comprised primarily players who had played competitively. JimBoh and Milo are both members of Team EXE, sponsored by Sleeper Gaming, which competes in the 2K Downunder League. The league is Australia and New Zealand’s foremost amateur Pro-Am league, comparable to the MyPlayer Basketball Association (MPBA) in North America. Many NBA 2K League players competed in the MPBA prior to the formation of the league, and the association’s founders have all found jobs with NBA 2K League organizations. Idc what anybody says ANZ Proam is LIT! Like most serious amateur Pro-Am leagues, competition is for money, and in that arena the 2K Downunder League has grown rapidly. “Now there’s great prize money as 2K Downunder League cashed up and has well-organized competitions with about 5-6 thousand per year in prize money from sponsors,” Callaghan said. Team EXE won the second season of the 2K Downunder League. Players assumed that NBA 2K League officials would invite players to the APAC tournament based on their success in the 2K Downunder League. But as the days passed and no email came, tensions mounted. Two Australian players, baqqy__ and Paul10810_Kille, qualified for the Top 200, the penultimate cut before the draft pool. “When I didn’t get an email about the 200, I still kept my head up because I knew there could be something coming our way,” said Milo. Players turned their hopes to the APAC tournament. “I was coming home from work and SquareUpPencil [another New Zealand competitive player] received an email and told us to check ours. There was nothing in my email. I probably refreshed my email over 100 times that day and still nothing,” Milo said. When the NBA 2K League sent out its first wave of invitations for the APAC Invitational, neither Milo nor JimBoh got one. Three or four Australian players, including players from the team Sleeper Gaming had defeated en route to its championship, were invited in the first wave. Milo and JimBoh waited and waited. The two friends commiserated with each other, each desperate for insight into the league’s selection process. Their stats appeared far superior to those of several players who had received an invite. The first thing JimBoh did was call his parents. “They were so happy for me because they know how much time and effort I put into NBA 2K over the years.” His next call was to Milo, who still had an empty inbox. Milo stayed on the hot seat. He talked daily with Rangee, a top Australian point guard who also had not been contacted by the league, each confirming that the other was bereft of an invite. “I was playing at the Park [in NBA 2K] and I refreshed my emails, not thinking that there would be one there, and I saw it pop up. I was just staring at it for a solid ten seconds and then it just hit me.” Several days after JimBoh received his invite, the last wave of emails went out. Milo was one of the last recipients. One day later, the league formally announced the Asia-Pacific Invitational Tournament. The league’s first-ever international qualifying event will take place Saturday, Feb. 2 – Sunday, Feb. 3 in Hong Kong, with 20 players from China, the Philippines, Australia, and New Zealand. Baqqy__ and Paul10810_Kille made the final draft pool. But Milo and JimBoh have their sights set on the APAC Invitational. The league will decide to add several players to the pool based on exceptional performance in the tournament. Both players intend to showcase their talent on the live stage in front of NBA 2K League scouts. But it’s about more than their individual performance. “I believe this is a chance for Australian and New Zealand players to show what our server can do and that we are good enough to compete on the biggest stages,” JimBoh said. Callaghan believes that Australian Pro-Am players can step into the league right away. “Milo, to me, could seriously surprise like [Knicks Gaming] center Goofy757 as a paint stopper and rebounder. JimBoh offers competency at the guard spot, I see him as a great creator with the ball.” Callaghan thinks that baqqy__, one of the two Australian players to make the draft pool through the combine, compares similarly to T-Wolves Gaming centerpiece Hood. Milo and JimBoh are excited for what they see as an incredible opportunity that even the players in the draft pool, who qualified through Skype interviews and gameplay in relaxed settings, don’t have. At the APAC tournament, players will have the chance to speak with scouts as well as prove their mettle in a tournament on the big stage. For Milo, who watched nearly every NBA 2K League game last year despite the time difference, the desire to make the league stems from the same global spirit from which the tournament was created. He wants to be one of the best centers in the world, not just in Australia, and making the league is the way to do that. The tournament is a chance to showcase their skills and show the world that there’s a video game Ben Simmons out there. 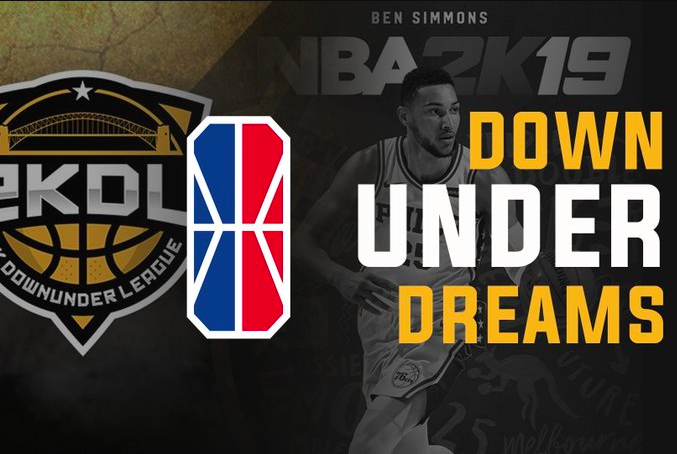 The long-term development of Australian Pro-Am and the short-term wait for the email can all be worth it, because the APAC tournament is keeping their dream alive, 10,000 miles from the bright lights of the NBA 2K League.